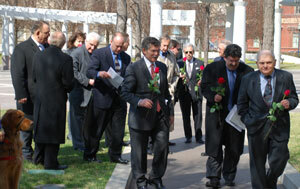 At a ceremony held on March 12, 2009, at the National Law Enforcement Officers Memorial, to commemorate the assassination of Giuseppe "Joe" Petrosino, James Di Santis, Executive Director of the National Italian American Foundation, said that it was important to recall the story of Lt. Petrosino because "too many journalists still feel comfortable in drawing associations between Italian Americans and organized crime. " De Santis said that the media "overlooks our strenghts as an ethnic group that still cherishes a strong family structure, deep religious convictions and a passion for doing what is right." 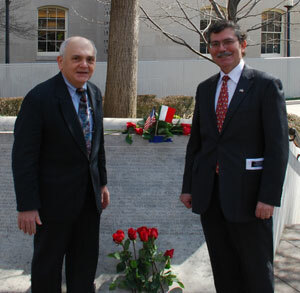 The commemoration was sponsored by the Friends of Charles Bonaparte, a group of current and former U.S. Department of Justice officials who support an annual ceremony commemorating Bonaparte, the 46th Attorney General and the Founder of the Federal Bureau of Investigation. Attending the event were senior officials of the U.S. Department of Justice, Lou Scalfari, the President of the Lido Civic Club, the oldest Italian American civic organization in the Nation's Capital, and Pino Cicala, the Italian American voice in Washington DC and producer of Antenna Italia. Francesco Isgro, a co-founder of the of the Friends of Charles Bonaparte, said in his welcoming remarks that the anniversary of the assassination of Petrosini was "an event that should not go unnoticed by all Americans and especially Italian Americans." 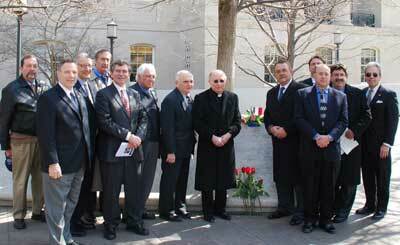 Father Lydio Tomasi, Pastor of the National Italian parish, Holy Rosary Church gave an invocation. Joe Grano, the Chair of the Constantino Brumidi Society and also an organizer of the event, recounted the life of Petrosino from his roots in Padula near Salerno, to his funeral in New York City where more than 200,000 people lined up the streets during his funeral procession. Hon. 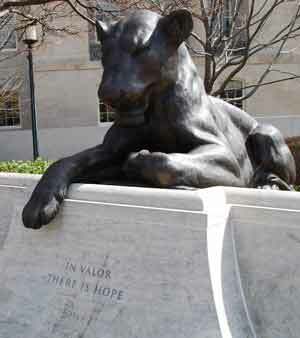 Francis M. Allegra, federal judge for the U.S. Court of Claims, and a former DOJ official, spoke about the "rule of law" and how all enforcement officers whose names are engraved on the Memorial, including Jospeh Petrosino, sacrificed their lives to uphold the rule of law. NIAF's National Executive Director, said that it was important that we recognize "modern-day Lt. Petrosino’s who dedicate their lives to sustaining a society that is characterized by its respect for the law. We can all take great pride in those Italian Americans in law enforcement, the legal profession and the bench who carry out their responsibilities with dignity, fairness and passion." 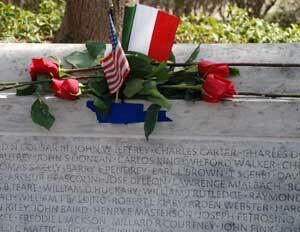 Following the remarks, the attendees placed red roses on the wall were Petrosino's name is engraved for eternity. 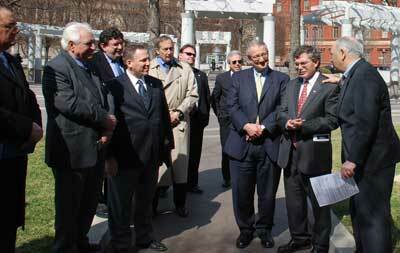 Click here to read NIAF Executive Director James Di Santis' remarks. Click here to read Ho. Francis Allegra's remarks.